As we diabetics well know, to beat our diabetes we should make plants, such as vegetables, the main focus of our diet. But not all vegetables are equally beneficial. Some of most healthful are in the group known as cruciferous vegetables. But what are they and what are the benefits of eating cruciferous vegetables? The Cruciferae family of vegetables are cool-weather vegetables. They are so called because they have four petals so that (with a bit of imagination) they seem to resemble a cross. 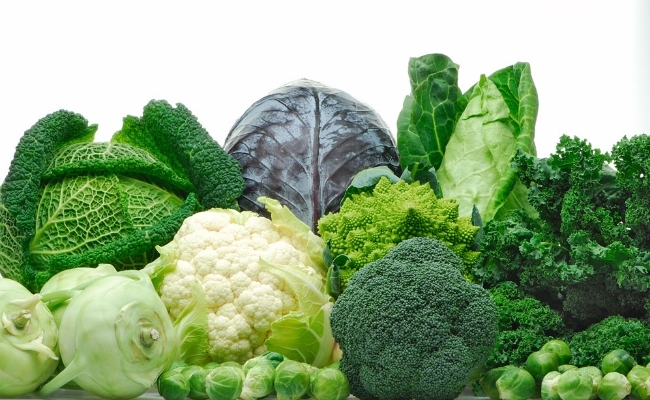 Cruciferous vegetables are high in several vitamins and soluble fibre. They also contain multiple nutrients and phytochemicals. Cruciferous vegetables are low in calories but rich in folate, vitamins C, E and K and soluble fibre. These vegetables are also good sources of phytonutrients … plant-based compounds that may help lower inflammation and reduce the risk of developing cancer. Cruciferous vegetables also contain glucosinolates, chemicals that are responsible for the aroma and flavour of these plants. These chemicals have been shown to have anti-cancer effects. According to the National Cancer Institute in the USA, studies in rats and mice have shown that indoles and isothiocyanates (compounds that are formed when glucosinolates are broken down) provide cells with protection against damage to their DNA, inactivate carcinogens, and have anti-bacterial and anti-viral effects. But the evidence that this also happens when humans consume cruciferous vegetables is underwhelming. Studies of cancers such as of the prostate, colon, lung and breast, show little or no association between eating these vegetables and the risk of developing these specific cancers. However, cruciferous vegetables may help to protect against cancer by reducing oxidative stress. Oxidative stress is an overload of oxygen-free radicals, harmful molecules generated by the body. Reducing free radicals probably reduces the risk of various cancers such as colon, lung, breast and prostate. In a study funded by the US National Cancer Institute, 20 participants ate two cups of cruciferous vegetables a day for three weeks after which they reverted to their normal eating habits. When their oxidative stress was measured at the end of the three weeks, it was found that it had dropped 22% when they were eating lots of cruciferous vegetables. Diets rich in fish and cruciferous vegetables may help to protect against cardiovascular disease. A recent study found that this kind of diet was linked to lower levels of markers for inflammation in the body … markers that signal an increased risk of cardiovascular disease. Eating plenty of cruciferous vegetables will not harm you. However, they are likely to improve your health and reduce your risk of various chronic diseases. So, eating them is highly recommended. Eat these vegetables raw or only lightly steamed. If you overcook them they can have a strong sulphurous smell and taste. You will find cruciferous vegetables such as Brussels sprouts, broccoli, and cauliflower ready-to-go in the fresh food or frozen foods section of your supermarket. Only buy fresh broccoli … it has firm florets with a purple, dark green or bluish hue at the top. These will have more beta-carotene and vitamin C than florets with light green tops. If broccoli is yellow or limp don’t buy it … it is old. Snowy white broccoli florets or dark green broccoli is a must for any raw vegetable platter. You can add chopped cruciferous vegetables to soups, stews and casseroles during a final few minutes of cooking (to avoid over-cooking them). Bpak choi ….. is a kind of Chinese cabbage that looks like a hybrid of celery and lettuce. It has a mild flavour and fits well in stir-fries or soups. If you make a noodle soup with bpak choi, chuck in a little bit of chopped ginger to give it a kick. Broccoli ….. can be eaten raw on its own, in a salad or with a dip as a quick snack. Try steaming it (but don’t overdo it) and topping it with a low-fat sauce. You could also roast it in the oven. If you don’t care for the taste but want the nutrients, drop it into a strongly-flavoured casserole. Brussels sprouts ….. the bane of generations of school children, are usually eaten in winter especially during Yuletide. They have a very distinctive taste. They are usually boiled but try roasting them in the oven. Cabbage ….. is usually overcooked so be careful. Another cruciferous vegetable with a distinctive but mild taste, cabbage goes well with most main courses. Or it can be shredded and mixed with beans and sweet potatoes to make a potent side-dish. Kale ….. is slightly more bitter than spinach or lettuce but is highly nutritious. You can sauté it with a drop of olive oil, garlic and pepper for a quick side-dish or bake it in the oven with some seasoning as a substitute for potato. Or drop a few raw leaves into a smoothie to boost your drink’s vitamin and mineral content. Radishes ….. are the perfect garnish for a fresh salad. Unlike the other cruciferous vegetables above the roots, rather than the leaves, are eaten. Radishes have a peppery taste and besides giving a plain old salad a pleasant lift, they can be eaten glazed with mint and onion, or glazed and roasted with fresh herbs. Turnips ….. are another root vegetable. They have a purple skin. Their texture is similar to that of potatoes, but they have a much more distinctive, slightly peppery, flavour. In fact, once boiled they can be mashed and used as a substitute for potatoes in a main course ….. or mashed and mixed with boiled mashed carrots with a little added black pepper.